The Bare Metal service, codenamed ironic, is a collection of components that provides support to manage and provision physical machines. A RESTful API that processes application requests by sending them to the ironic-conductor over remote procedure call (RPC). Can be run through WSGI or as a separate process. Adds/edits/deletes nodes; powers on/off nodes with IPMI or other vendor-specific protocol; provisions/deploys/cleans bare metal nodes. ironic-conductor uses drivers to execute operations on hardware. A python service which is run in a temporary ramdisk to provide ironic-conductor and ironic-inspector services with remote access, in-band hardware control, and hardware introspection. A database to store hardware information and state. You can set the database back-end type and location. A simple approach is to use the same database back end as the Compute service. Another approach is to use a separate database back-end to further isolate bare metal resources (and associated metadata) from users. An oslo.messaging compatible queue, such as RabbitMQ. It may use the same implementation as that of the Compute service, but that is not a requirement. Used to implement RPC between ironic-api and ironic-conductor. The Bare Metal RESTful API service is used to enroll hardware that the Bare Metal service will manage. A cloud administrator usually registers it, specifying their attributes such as MAC addresses and IPMI credentials. There can be multiple instances of the API service. The ironic-conductor process does the bulk of the work. For security reasons, it is advisable to place it on an isolated host, since it is the only service that requires access to both the data plane and IPMI control plane. There can be multiple instances of the conductor service to support various class of drivers and also to manage fail over. Instances of the conductor service should be on separate nodes. Each conductor can itself run many drivers to operate heterogeneous hardware. This is depicted in the following figure. The API exposes a list of supported drivers and the names of conductor hosts servicing them. the OpenStack Compute service (nova) works with the Bare Metal service and acts as a user-facing API for instance management, while the Bare Metal service provides the admin/operator API for hardware management. The OpenStack Compute service also provides scheduling facilities (matching flavors <-> images <-> hardware), tenant quotas, IP assignment, and other services which the Bare Metal service does not, in and of itself, provide. the OpenStack Object Storage (swift) provides temporary storage for the configdrive, user images, deployment logs and inspection data. The diagram below shows the logical architecture. 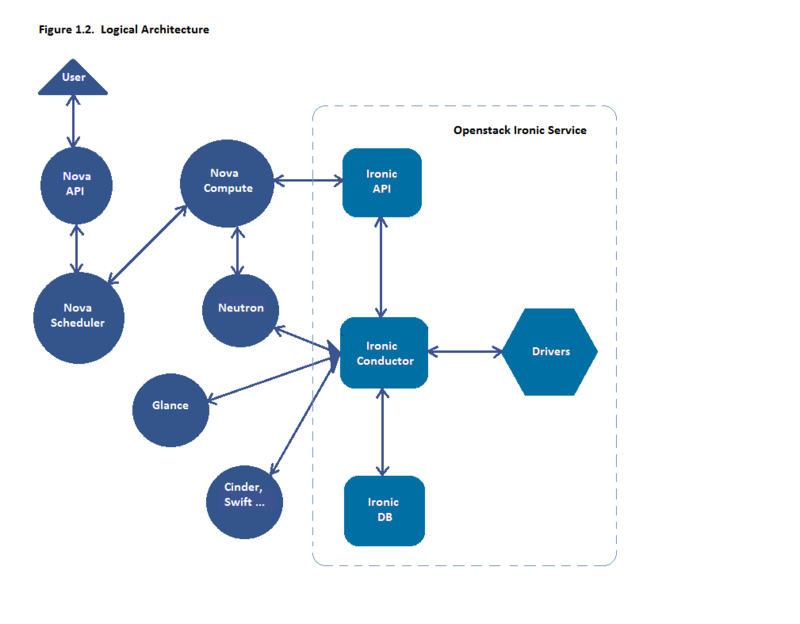 It shows the basic components that form the Bare Metal service, the relation of the Bare Metal service with other OpenStack services and the logical flow of a boot instance request resulting in the provisioning of a physical server. A user’s request to boot an instance is passed to the Compute service via the Compute API and the Compute Scheduler. 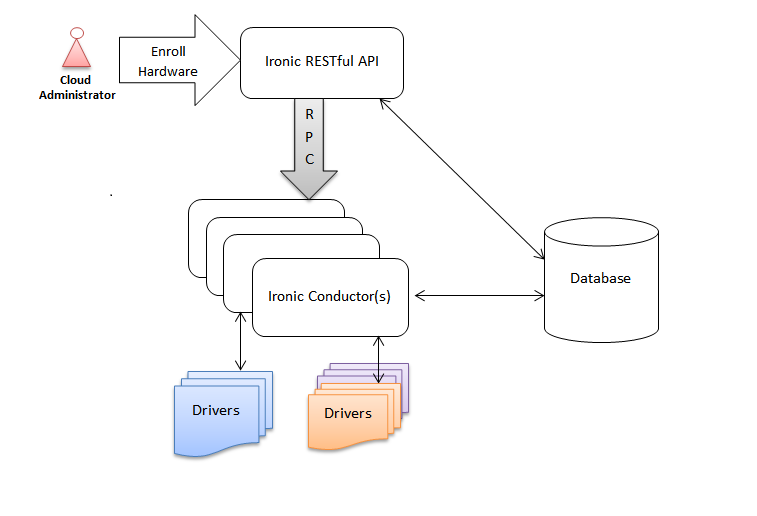 The Compute service uses the ironic virt driver to hand over this request to the Bare Metal service, where the request passes from the Bare Metal API, to the Conductor, to a Driver to successfully provision a physical server for the user. Just as the Compute service talks to various OpenStack services like Image, Network, Object Store etc to provision a virtual machine instance, here the Bare Metal service talks to the same OpenStack services for image, network and other resource needs to provision a bare metal instance. See Understanding Bare Metal Deployment for a more detailed breakdown of a typical deployment process. A command-line interface (CLI) and python bindings for interacting with the Bare Metal service. Horizon dashboard, providing graphical interface (GUI) for the Bare Metal API. An associated service which performs in-band hardware introspection by PXE booting unregistered hardware into the ironic-python-agent ramdisk. A related project to help facilitate the creation of ramdisks and machine images, such as those running the ironic-python-agent. A set of Ansible playbooks that automates the task of deploying a base image onto a set of known hardware using ironic in a standalone mode.